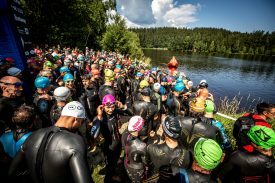 Ruben Ruzafa and Helena Karaskova-Erbenova captured the 14th annual XTERRA Czech off-road triathlon elite titles in Prachatice on Sunday, July 15, 2018. It’s the third big win in two weeks for Ruzafa, who won XTERRA France on July 1 and the ITU Cross Tri World Title in Denmark on July 10. The 33-year-old who lives in Aizarnazabal, Spain, is a three-time XTERRA World Champ and four-time ITU Cross Tri World Champ. He has now won all three XTERRA majors he raced this year and 33 of the 42 XTERRA World Tour events he has competed at in his career. For Karaskova, the reigning and four-time XTERRA European Tour Champion, the win is her second this season and 29th of her career, and she has now won four of the last five XTERRA majors in her home country of the Czech Republic. In the men’s elite race Maxim Chane from France was first out of Kristanovicky Lake with a swim time of 17:48, followed by Aussie Ben Allen and Kiwi Sam Osborne about 20-seconds back, then Bradley Weiss, Lukas Kocar, and Hannes Wolpert not far behind. Ruzafa was out of the water less than two minutes after Chane. “The hard work Ruben put in during the off-season to improve his swim is rewarding him now, as he’s losing very little time to his opponents,” said XTERRA European director Nicolas Lebrun, who himself won XTERRA Czech five times in his career. At the 10km mark on the mountain bike Chane, Weiss, and Osborne were riding together up front, Kocar was in fourth and Ruzafa had made up a full-minute and was in fifth. By the 19km point on the bike Ruzafa had pulled into the lead and put 40-seconds on the trio of Chane, Weiss, and Osborne. Kocar was in fifth right behind them, then came Austrian Andreas Silberbauer.